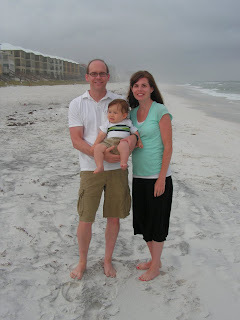 With the dreary summer days we are having this week, I thought that I would post about our family vacation to Destin, Florida earlier this summer. We went in May with David's family before it was too hot and too crowded. Our family joined Grandpops and Nana, Uncle Greg, Aunt Angie, Elijah and Meadow, and Uncle Steve, Aunt Julie, Luke and Katie. 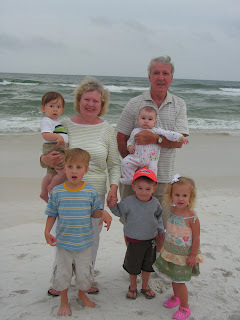 Thanks, Nana and Grandpops for a fun week! This is the beach we would hang out on during the day but the homes in the background are not where we stayed. 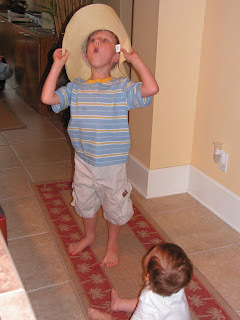 Elijah and Luke loved wearing Nana's hat and pretending they were "Nana" while they did. Asher watching. Keeping ourselves shaded while playing on the beach. 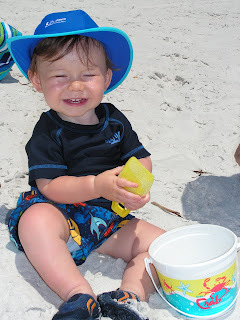 Asher LOVED playing in the water (although not the waves) and the sand. Daddy and Asher in the neighborhood pool. Asher enjoying his shovel and bucket. Cousin Luke checking out the crabs at a "local" pier restaurant we ate. Family picture on the pier after we had dinner.